Beautifully manicured gardens and a sweeping rural landscape provide the backdrop to this classically designed four-bedroom home which provides abundant space to deliver a comfortable lifestyle. 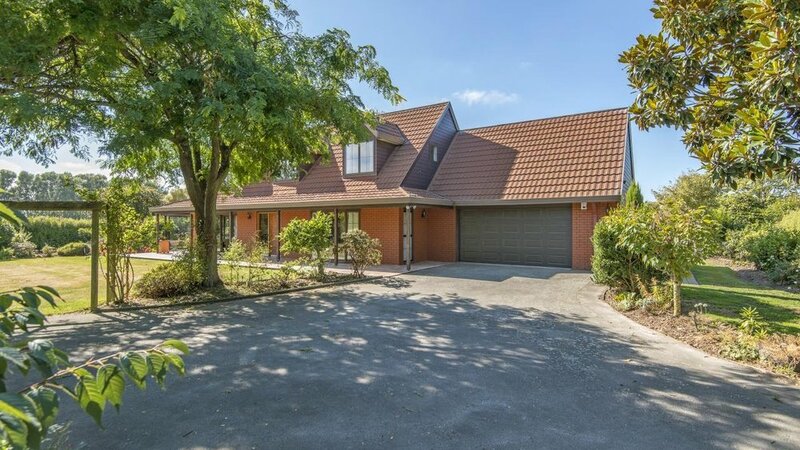 This property defines country convenience as it is located within minutes of Halswell, Prebbleton and Christchurch City offering the best of both worlds. A picturesque driveway lined with towering trees welcomes you to this immensely private home, and when you step foot inside, your eye will appreciate the neutral hues, timber elements and three contemporary bathrooms which provide an attractive setting for everyday living. A thoughtful blend of informal and formal living areas guarantees the ability to host anything from small gatherings to larger get-togethers with the floor plan featuring an open plan kitchen and dining area, two living a separate lounge and a conservatory. Ample accommodation includes a well-proportioned master with an ensuite, while upstairs another of the bedrooms also has the luxury of an ensuite and walk-in wardrobe. This four-hectare section has sheep/deer fencing in place and contains five paddocks and one holding paddock. Two small tunnel houses are also present, while various outbuildings include an open bay shed and a selection of smaller sheds. The departing vendors have utilised the land as a market garden, and there is the potential for a continued income stream through leasing part of the property to a market gardener. Very rarely do lifestyle properties in this location come to the market, and therefore, your earliest inspection is encouraged to avoid disappointment.